- american live tv, more selection and better picture quality! 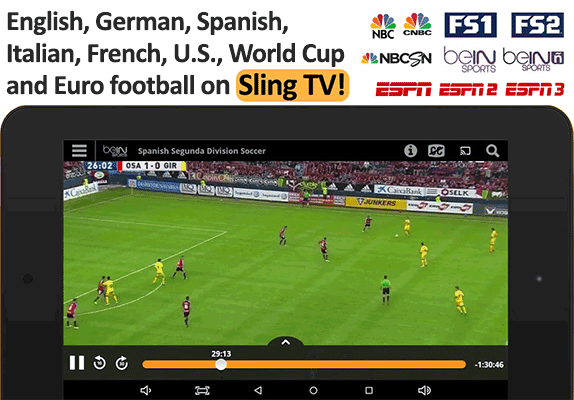 Sling TV is a brand new way to watch American and other International tv channels LIVE online, on your TV, media player or smart phone! Sling TV offers more channels with better picture quality than any other provider today! Sling TV offers a large selection of channel packages so you pick the ones that you like to watch! English Premier League (NBCSN/CNBC/NBC), European Championship (FS1/FS2/ESPN2&3), World Cup 2018 (FS1/FS2/ESPN2&3), English B Division (ESPN3), french/spanish/italian leagues (BeIN Sports), NBA (ESPN/TNT), various news channels, channels with programs for kids, movies, tv shows, reality shows, documentaries and many more! Unlike Hulu Live TV, Sling TV offers multiple different channel packages which means that you can tailor it to your preferences. A&E A&E’s mix of popular programming includes drama (Criminal Minds) and plenty of reality TV (Duck Dynasty, Storage Wars). AMC Movies and original series like Fear the Walking Dead. AXS TV AXS is a music-focused channel that also offers other types of programming, including mixed martial arts. BBC America The British Broadcasting Company’s American cousin shows BBC original programming. Bloomberg Another news station, Bloomberg Television includes programs like Bloomberg Markets and Charlie Rose. Bravo Reality shows and game shows like Top Chef dominate this channel. Cartoon Network/Adult Swim Cartoon Network plays great cartoons aimed at kids; Adult Swim features offbeat comedies aimed at adults. 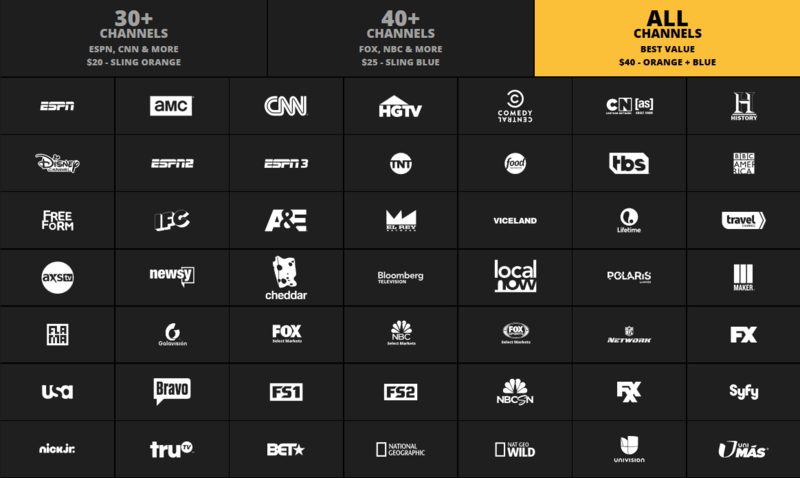 Just like with normal cable, these channels share airspace on Sling TV and won’t both be available at once. Cheddar A Sling exclusive, Cheddar is a finance news channel with a focus on startups and technology. CNN CNN airs news coverage and news programming around the clock. Comedy Central Comedy Central airs all comedy all the time. Among their best-known programs are South Park and The Daily Show. Disney Channel Disney’s TV channel offers original shows and made-for-TV movies aimed at kids. El Rey This English-language channel targets a Latino audience. Reality shows share space with gritty drama and action programming. ESPN The country’s most popular sports channel. Live sports and news, plus access to online content via the WatchESPN app. ESPN2 More content from ESPN, including college sports, news, and more. ESPN3 ESPN’s online-only content, branded as ESPN3, usually covers more minor sporting events. Flama Flama is Univision’s OTT service. It offers English-language programming aimed a young Latino audience. Food Network Cooking and restaurant shows like Diners, Drive-ins, and Dives. Freeform Freeform is the new name for the former ABC Family. ABC’s second channel features popular shows like Pretty Little Liars. FS1 FOX Sports 1 is FOX’s answer to ESPN. It airs live sports and sports news programming. FS2 Even more sports from FOX. FX FX airs original series, mostly comedies. FXX FXX expands on FX’s offerings with more original comedies and Hollywood movies. Galavisión Galavisión is a Spanish-language network that airs a wide range of programming, from telenovelas to soccer. HGTV HGTV airs lifestyle programming related to home buying and renovations. It focuses mostly on reality shows. History History channel airs history-themed programming, including documentaries and reality TV shows. IFC IFC features offbeat comedies like Portlandia and Comedy Bang! Bang! Lifetime This channel features programming aimed at a female audience. They have both shows and original films. Local NOW Local Now displays local headlines, plays news clips, and shows local weather. It’s a joint venture of Sling TV and The Weather Channel. Maker Maker is a channel from Maker Studios (which also owns Polaris). Maker Studios produces a wide range of web content (such as the Epic Rap Battles of History YouTube series). This channel airs a diverse array of short web videos. National Geographic National Geographic airs programming related to science, history, and culture. Nat Geo Wild Nat Geo Wild focuses the National Geographic formula on just the natural world. Expect programming about animals and nature. NBCSN NBC’s sports network shows news and live events, including NHL games, soccer, motorsports, and horse racing. Newsy Newsy aggregates news videos from various sources. NFL Network The NFL’s dedicated channel features game replays, documentaries, analysis, and more. It’s all NFL, all the time. Polaris+ Polaris+ is a Sling TV exclusive. It’s an extension of the online gaming network Polaris, and features gaming-focused programming. SyFy SyFy is an all-science fiction channel. TBS TBS airs original and syndicated programming, particularly comedies. TNT TNT offers dramas, comedies, and other programming, plus some NBA basketball games. Travel Channel As you’d expect, the Travel Channel airs specials and reality shows about travel destinations. USA USA shows syndicated shows and original series, including dramas, comedies, and more. Viceland Viceland is Vice Media’s TV channel, and it airs what you’d expect from Vice: edgy news and lifestyle programming for the Millennial set. beIN Sports beIN Sports primarily covers soccer. Campus Insiders Campus Insiders airs college sports from Conference USA, the Mountain West Conference, the Patriot League, and the West Coast Conference. ESPN Bases Loaded This ESPN channel jumps around to live and recent highlights from in-progress college baseball games. This channel is only active during games at the peak of the baseball season. It shares channel space with the other two ESPN in-game highlight channels. ESPN Buzzer Beater This ESPN channel jumps around to live and recent highlights from in-progress college basketball games. This channel is only active at game times during the college basketball season. It shares channel space with the other two ESPN in-game highlight channels. ESPN Goal Line This ESPN channel jumps around to live and recent highlights from in-progress college football games. This channel is only active at game times during the college football season. It shares channel space with the other two ESPN in-game highlight channels. ESPNews ESPN’s news channel will feature SportsCenter and other news programming, even when ESPN’s flagship channel is too busy showing live sports or documentaries. ESPN U ESPN U covers college sports, primarily less popular sports or match-ups that ESPN doesn’t air on their flagship station. Golf Channel All golf, all the time. NBA TV NBA TV is the NBA’s league-run channel. Its all-NBA lineup includes live games and news/opinion programming. NFL RedZone This NFL channel jumps around from game to game to catch exciting potential scoring plays from across the league. NHL Network The National Hockey League’s dedicated network includes hockey news and live games. Outside TV As the name suggests, Outside Television features outdoorsy shows. Running, biking, hunting, and the like dominate the programming here. Outside Television is the TV arm of Outside Magazine. Pac-12 Networks College sports action from the Pac-12 conference. You’ll get all 6 regional Pac-12 feeds. SEC Network Run by ESPN, this network offers complete coverage of SEC (Southeastern Conference) college sports. SEC Network+ An online-only extension of SEC Network, SEC Network+ covers SEC sporting events that don’t make the cut on the main channel. CMT CMT is MTV for country music. Its reality programming tends to highlight rural lifestyles. GSN Originally called the Game Show Network, this channel airs classic game shows like Family Feud alongside new original game shows. Logo TV Logo TV targets an LGBT audience. MTV Once a music video giant, MTV now focuses on reality and lifestyle programming. MTV 2 Like its big brother, MTV airs reality shows. It also shows music videos at certain times. Spike Spike tends to focus on a male audience. It airs reality programming on subjects like extreme sports accidents. TV Land TV Land once focused on classic TV, but now features a mix of classic and modern programming. Baby TV Programming for the youngest of the young. Boomerang Cartoon Network’s all-classic cartoon channel. Disney Junior Disney Junior is aimed at younger audiences (like toddlers) than the main Disney Channel. Disney XD Disney XD targets older children, like pre-teens and teens. Duck TV Duck TV’s target audience is very young children. NickToons As the name suggests, this Nickelodeon-owned channel airs cartoons from its parent channel. Sling Kids This on-demand channel features a wide range of children’s TV shows. Teen Nick Nickelodeon for the (slightly) older set. Expect live-action comedies. BBC World News World news from the British Broadcasting Company. CNBC NBC’s finance news channel. Euro News News from a European perspective. France 24 English-language channel that offers news from a French perspective. Fusion Jointly owned by ABC and Univision, Fusion mixes pop culture news with traditional reporting. It targets a millennial audience. HLN HLN is a spin-off of CNN that was original known as CNN2. It focuses on longer-form reporting, including opinion and tabloid-style pieces. MSNBC NBC’s political news channel. News 18 India News from an Indian perspective. RT This English-language Russian news channel is funded by the Russian government. TheBlaze A conservative news and talk station that features Glenn Beck. Cooking Channel The Cooking Channel features instructional and reality cooking programming. DIY The DIY Network offers how-to programming, reality shows, and other programming related to home improvement and do-it-yourself work. E! E! features entertainment and pop culture programming. You’ll get updates from the red carpet and reality shows like Keeping Up With the Kardashians. FYI FYI offers reality TV programming. LMN A spin-off of the Lifetime Network. Like its parent channel, LMN primarily offers programming aimed at women. Hallmark Channel Family-friendly movies, series, and TV specials. Hallmark Movies & Mysteries This channel airs original movies and mystery series. Oxygen Oxygen’s reality TV, movies, and scripted programs are aimed at a female audience. VH1 VH1 started as a music channel like MTV, but now focuses on pop culture programming more broadly. Vibrant TV Vibrant TV features programming from all different genres, drawn from international sources that American audiences might not be familiar with. WE tv WE tv offers a mix of reality TV and traditional programming. It primarily targets a female audience. Epix Movie streaming on demand. Epix also offers major boxing events. Epix 2 More movies and content available on demand from Epix. Epix2 also offers MMA events. Epix Drive-In More movies and content available on demand from Epix. Specializes in action films, comedies, sci-fi movies, and other films from the 1970s to today. Epix Hits This is the former Epix3, and offers more movies and content available on demand from Epix. HDNet Movies This movie channel specializes in blockbusters. Sundance TV Shows independent and foreign feature films. TCM Turner Classic Movies shows films from the Golden Age of Hollywood. STARZ Encore STARZ Encore is the sister channel to STARZ. It offers more movies and original series. AZ Cinema Azteca’s movie channel. AZ Clic An entertainment channel from the Azteca family. Azteca Mexican soccer coexists with telenovelas and more. AZ Corazón Azteca’s telenovelas channel. BabyTV Programming for the youngest of the young. beIN Sports ñ There’s soccer galore on beIN’s Spanish-language channel. Cbeebies A BBC-owned network for young children. Cine Sony Television Sony Pictures movies in Spanish. Cinelatino This channel shows movies in Spanish and focuses on films that were produced that way (rather than dubbed in post-production). De Película This Spanish-language film channel focuses on Mexican cinema. DP Clásico More from De Película. This channel focuses on Mexican cinema from the 1960s and earlier. ESPN Deportes This sports channel is ESPN’s Spanish-language arm. NBC Universo NBC’s Spanish-language channel focuses on sports and reality shows. NTN24 A 24-hour Spanish-language news channel with plenty of opinions to share. Pasiones Telenovelas and nothing but Telenovelas, 24 hours a day and seven days a week. TeleFórmula A Spanish-language news channel. Telehit Music and music videos for a Spanish-speaking audience. TeLe-Romantica A telenovelas and lifestyle programming channel aimed at women. Zee Mundo This channel features Bollywood movies dubbed into Spanish. CUBAMAX TV This channel airs programming from Cuba. Telemicro Internacional A variety of programming (including movies, telenovelas, and more) from the Dominican Republic. TV Quisqueya A popular Dominican channel. WAPA America This Puerto Rican channel shows sports, movies, sitcoms, and more. Antena 3 This popular Spanish channel airs talk shows, dramas, and sitcoms. MIS Películas A Spanish-language movie channel. SupereÑe An education and entertainment channel for kids. TVE Spain’s national state-owned broadcaster. Aaj Talk A 24-hour Hindi news channel. B4U Music An Indian pop music channel. Expect a mix of Bollywood, Indipop, and Bhangra. Food Food An Indian lifestyle channel with a focus on (you guessed it) food. NDTV 24×7 New Delhi, India-based English-language news station. News18 An Indian news station. Sony SAB Sony’s Indian TV channel features comedies and other TV programs. Sony Mix Bollywood Music from a Sony-owned Indian channel. Zoom Keep up with the Bollywood stars with this Indian entertainment news channel. LA7 This Italian channel broadcasts comedies, movies, cooking shows, and more. Rai Italia An Italian-language international channel featuring news, drama, documentaries, sports, and more. RaiNews24 Rai’s Italian-language news station. Caracol TV This Colombian channel features a variety of programming. Ecuavisa Internacional News and entertainment from Ecuador. NTN24 Spanish-language 24-hour news network. Nuestra Tele An entertainment channel from Colombia. RCN Novelas Telenovelas from Colombia. TyC Sports This Argentine channel covers soccer and other sports. English Premier league is on Sling TV! 4-6 of the best matches from the EPL live every weekend! Which devices does Sling TV work on? What add-ons are being offered? 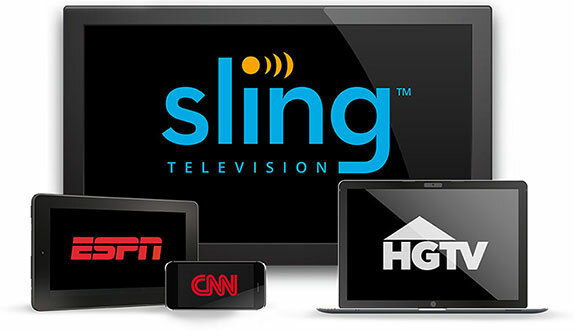 You can watch Sling TV on 3 devices at the same time if you select the Blue package and 1 device for the Orange package. If you subscribe to them both then you can watch 4 devices simultaenously. 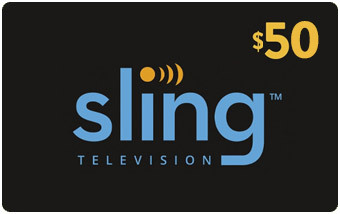 You can also record up to 50 hours if you select the DVR package which is $5 per month. Please note that some programming cannot be recorded. Great service! Received the card instantly. Definitely buy it again.